Need a Contractor to Repair Your Thermostat in Reeds, Missouri? Essential for the operation of your heating and cooling system, thermostats must be maintained on a regular basis for peak efficiency. When you need repairs to your thermostat in Reeds, Missouri, Barone's Heat & Air, LLC has the experience and product expertise to handle the project quickly and affordably. Our local technicians are ready to serve Reeds customers on short notice and Barone's Heat & Air, LLC can schedule regular thermostat inspections in advance. Providing thermostat repair in Reeds since 2009, Barone's Heat & Air, LLC has helped countless homeowners and businesses maintain an efficient, dependable heating and cooling system with regular thermostat inspections, repairs and replacement. Trust in our expertise earned through years of local experience. We service a wide variety of customers for thermostats in Reeds, and carry a large selection of thermostat models to meet the unique needs of each customer. Whether you need a modern touchscreen thermostat, or want to upgrade to a model that is programmable or works with multiple zones, Barone's Heat & Air, LLC has quality models from the leading manufacturers, all backed by our commitment to customer service. Barone's Heat & Air, LLC offers professional service at reasonable prices, designed to meet the budgets of Reeds residents and businesses. Call (417) 232-0017 and ask about prices for repairs to your thermostat in Reeds, Missouri, or inquire about thermostat replacements and upgrades. 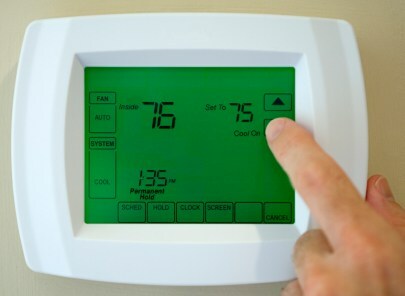 A modern thermostat can help you to save money on your monthly heating and cooling bills and Barone's Heat & Air, LLC prices help you to quickly recoup the initial investment. Reeds customers trust the experience of our technicians and the reasonable prices offered by Barone's Heat & Air, LLC when it comes to heating and cooling. Hire the experts at Barone's Heat & Air, LLC for replacement or repairs to your thermostat in Reeds, Missouri and choose from a wide selection of top thermostat models. Call (417) 232-0017 today for more details.